Pulos and Hutt (1969) observed that mating between white horses produces white and coloured foals in the ratio of 2:1 instead of 3:1. It was assumed that this was due to the death of homozygous embryos or foetuses early in gestation. I've looked into this because it appears to be controversial, and I've heard conflicting opinions about it. Some have rubbished the paper, while others have told me that much of it is not unreasonable. It's a pity that some of the earlier cited papers in Pulos and Hutt are in German (for me that is, as I don't read German and the papers look interesting!). Before going further I'd just like to comment that with an old paper like this some issues may have to remain unresolved. A friend of mine went to the Pulos stud and tried to trace the horses for resampling, but they were already dispersed. Anything from history always has to be viewed in the context of the time, which is not always an easy thing to do. Despite the critisisms I've heard, the staistical side of things in the paper looks okay to me. Chi-square tests are well adapted to deal with this sort of limited animal data, one needs to be cautious about chi-square comparisons if any classes compared (here white and non-white)contain fewer than five individuals, which is not the case with the data here. The ratio for the overall data is almost a perfect fit to a 2:1 ratio (28 white: 15 non-white, chi-square value=0.046, df=1, P=0.83, and 0.87 for a Monte Carlo estimation). The chi-square value is a measure of difference of the data from that expected from theoretical data in an exact 2:1 ratio (expected values are 28.67and 14.33). The degrees of freedom (df) reflect the number of comparisons being made (NOT the sample size, which is accounted for in the calculation itself). The probability values are those for the observed data being insignificantly different from the theoretical ratio (2:1). Probability values are given for estimation by two methods, the traditional one and the computing intensive Monte Carlo technique using a thousand resamples (unless you know stats you can forget this last bit!). The point is that the probability of the data fitting to the theoretical 2:1 ratio is very high. The data for the progeny of Snow King and blue eyed mares fits to a 2:1 ratio with a probability of P=0.74 (0.81 for the Monte Carlo estimate). The data for the progeny of Snow King and brown eyed mares fits to a 2:1 ratio with a probability of P=0.72 (0.80 for the Monte Carlo estimate). One can also test the data against a 3:1 ratio, which one would expect for crosses between horses heterozygous for a dominant gene with no lethal effect. In this case the probability is 0.13 (0.16 for the alternate Monte Carlo estimation). This is not statistically insignificant, but there is a much lower probability of the 3:1 ratio being the real case, given this data. Of course from a dominant homozygous horse all offspring would be white, so for a mixture of the two types a ratio of greater than 3:1 would be expected, which will fit the data less well than a 3:1 ratio. There are critisisms about not now being able to know the patterns among foals, or in the mares or stallions pedigrees (odd comments do indicate there were a few). There's no way of proving that the horses used were all dominant white, and skeptics will doubtless always point this up. From the statistics though I'd say that if there was a substantially heterogenous breeding population with a lot of sabino and/or other patterns, the observed ratios of white to non white foals would have been likely to be substantially different to those actually observed. In particular one might expect fewer white foals than coloured and patterned ones. For the reasons above I do think that what Pulos and Hutt observed was substantially as described: a gene, or probably genes, that cause substantial white in a dominant form. Molecular evidence shows that these exist, and are not the same mutation which causes sabino, but which are nevertheless located in the same gene (that is they are allelic). What's more the data suggests the mode of inheritance is most likely (in statistical terms) as described, lethal dominant. The new molecular evidence is not contrary to this. Indeed similar mutations cause dominant lethal mutations in a whole variety of other animals. Given the (at least) four possibilites known about I'd be surprised if one or more of them aren't lethal dominant. Pulos and Hutt don't reach conclusions about the observed reduced conception rates, for fair enough reasons. It's interesting though that between two studies there were only 80/102 lasting pregnancies, from 102 matings. One potential problem of the study is that there are two groups of mares, one with brown eyes, one with blue eyes. At the moment the 11 characterised dominant white mutations all give brown eyed horses. 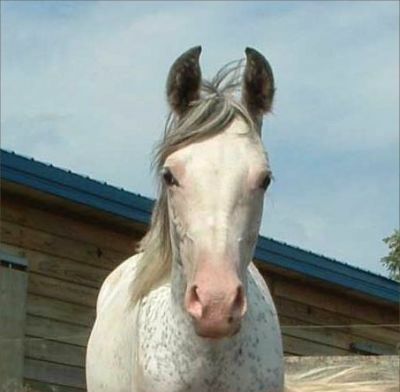 It is possible that the blue-eyed mares might have carried splash, in addition to dominant white, or that another mutation was involved, possibly a KIT gene uncharacterised at this time. It is hard to say much about this without knowing the origins of the mares involved, and whether some or all were related in some way. One observes though that a case is known where a brown eyed dominant horse, R Khasper, had a foal, Kholor By Design, with partial blue eyes (one almost completely blue, the other with a couple of small brown spots). It may be that R Khasper’s paternal grand sire, Khemosabi, had Splash White, which can cause blue or partially blue eyes. 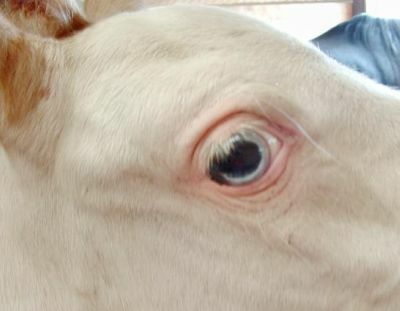 Alternatively R Khasper might have an as yet unidentified (possibly sabino type) mutation that may sometimes causes blue or partial blue eyes. In either case Kholor By Design may have inherited both genes, giving partially blue eyes. His half sister Khey To My Heart has brown eyes.